Learn More about Dental Implants with Dynamic Dental Work in Queens! There are many reasons why a tooth may go missing. Aging, dental trauma, and disease, are all contributing factors that have adverse effects on your health and appearance. Fortunately, dental implants have created a way to restore missing teeth and help you gain a healthy smile again. In Queens, the dental health professionals at Dynamic Dental Work can work with you to place dental implants and achieve a functional set of teeth yet again. 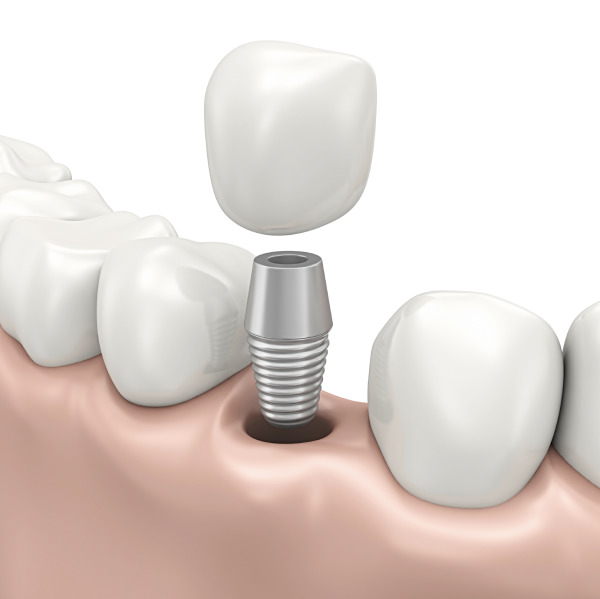 A dental implant consists of a titanium screw that is surgically placed into a healthy jawbone. During a healing period, the implant will fuse with the existing jaw tissues (a process called osseointegration) and will create a durable replacement tooth root that acts as a foundation for an artificial crown. Single-tooth replacement: A single dental implant is placed into the jawbone and, after a healing period, is capped with a custom-made, artificial crown. The process fills in any gaps created by one missing tooth. Multiple-teeth replacement: Two or more dental implants are placed that act as supporting anchors for a fixed bridge. The procedure replaces any missing teeth and does not involve any preparation to existing, natural teeth. Implant supported dentures: A complete denture that is secured into place with dental implants. Anywhere from four to six implants are placed in the jaw that connect to housing units in a full denture arch. The result of each procedure is a seamless smile that looks as if no teeth ever went missing! Dental implants are a fixed solution for restoring missing teeth that allow patients to regain their quality of life. There are a number of reasons why a patient may need a dental implant. By replacing one or more missing teeth, dental implants can relieve joint pain, restore eating and speaking abilities, solve bite issues, enhance facial tissues, create a healthier jaw, and boost self-esteem. Denture wearers no longer have to worry about loose-fitting dentures or creams and adhesives. And those with missing teeth can rest easy knowing that their natural teeth are not shifting position. With dental implants, patients receive a healthier smile that is maintained just like natural teeth. At Dynamic Dental Work, we can help you regain a natural smile once again. During an initial consultation with us, we will assess your medical history and determine whether your jawbone is healthy enough to withstand dental implants. We will take any necessary x-rays and schedule a follow-up appointment where your dental implants will be placed. The best way to determine whether dental implants are right for you is to schedule an appointment at Dynamic Dental Work. We look forward to helping you achieve the best smile possible! If you would like more information about dental implants or to schedule a consultation with us in Queens, contact Dynamic Dental Work today!